So, you have decided to get into an indoor trampoline routine. You know what exercises you want to use the trampoline to accomplish. You also know that you want to do more than just use the trampoline for its original purpose. This leads you to start looking for the ideal indoor trampoline that will fit your needs and goals. Here is some information on a few excellent indoor trampolines that you may want to consider. There are several folding trampoline options out there. A few of the top ones to look for are Stamina 36, Sunny Health, and Leaps & Rebounds. The reason that these trampolines make it to this indoor trampoline list is due to their portability. If you have a small apartment or space, then these should be at the top of your list. If you need to be able to take the trampoline with you for whatever reason, then it should also be something you should consider. Excellent indoor folding trampolines will be made of a steel construction and will be able to hold up to at least 200 pounds. Handrail trampolines are ones that have a handrail attached to the trampoline. These handrails can be removed easily, but are sturdy enough to use with full body weight. The reason a handrail trampoline should be considered an excellent indoor trampoline option is that of the uses it offers you. You can do arm workouts, planking, squats, balancing, and even bring life to your old Pilates and yoga workouts. They allow you a whole new world of workouts on your mini trampoline. If you are considering one of these options, you should look for handrails that attach with some sort of bolt system instead of a click system that can easily be broken or cause damage or injury during use. Jogger trampolines are the holy grail of mini trampolines for people that want a full indoor gym to feel. 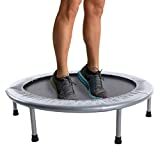 If you want to use your trampoline for a workout, jogging, body resistance, and full body circuit, then this is the one to go with. These come with resistance cords, handrails, and stability options on the base of the trampoline. This means that you can use them for planking, workouts, balance workouts and more. The jogger trampoline gives it all to you and is still portable. You can also find some that are folding as well. These are just a few of the indoor trampolines to consider. You can also consider creating your own option through accessories and add-ons.